Peter Jackson's latest fantasy film trilogy seems set to make a completely expected journey to the popular Lego video game series. If you haven't gotten your Lego fill yet from super heroes, Jedi, pirates and teenage wizards, Traveler's Tales looks to be preparing another entry in the series, this time based on the current The Hobbit film trilogy. Sidersdd, a forum user over at Lego website Brickset, posted an image from the back of an instruction manual that will be packaged with upcoming Lego sets based on the film series. The image lists a release year as 2014, along with logos for the Xbox 360, Nintendo 3DS, PC, Wii U and the PlayStation brand emblem. Below that can also be seen the logos for Traveler's Tales, the developer of every other Lego game from the past several years, and publisher Warner Brothers Games. The Hobbit film trilogy is due to wrap up next year, with The Hobbit: There and Back Again, which follows 2012's The Hobbit: An Unexpected Journey and this winter's The Hobbit: The Desolation of Smaug. 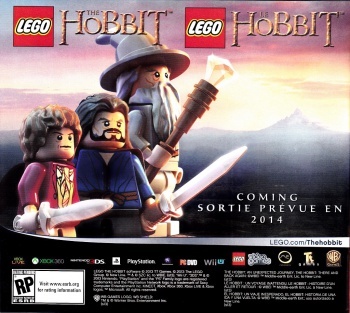 Considering that Traveler's Tales 2012 game, Lego Lord of the Rings, used elements from all three films of the first Middle-Earth trilogy, the smart money would be on the developer releasing Lego The Hobbit to coincide with the final film, so that the game can draw on all three Hobbit movies.